Shoshana, A. (2014) ‘Space, Heterogeneity, and Everyday Life: Ultra-Orthodox Heterotopia in Israel, Journal of Contemporary Ethnography 43 (5) 527-555. This article examines the relations between the characteristics of a space and the phenomenology of its residents, as well as the unique influence of the space on the social relations and the actions undertaken by the individuals and groups in it. It is based on ethnographies and in-depth interviews conducted at the Israeli ultra-orthodox town of Immanuel, which made the headlines on account of the ethnic selection carried out there, a scandal known as the “Israeli Brown Affair.” The ethnographic findings point to the dramatic heterogeneity of Immanuel’s population and to the quite overt disregard that the different groups show one another. In the interviews, Immanuel was explicitly defined as an “other place,” and a dialectic was reported between the invisibility of the space (referred to as its being “terra non grata”) and its visibility at times of crisis (terror attacks and ethnic selection). The interviews also highlighted the “paradoxicality” of the space (the simultaneous presence of cultural discrimination alongside expressions of resistance). In order to attain a nuanced understanding of space at Immanuel, Foucault’s (1986) concept of heterotopia is introduced. Moreover, given the different interpretations of the space offered by members of the different groups, the concept of multiple heterotopias is posited. The conclusion points to the complex relations between space, heterogeneity, and everyday life. Biennials and other large-scale recurring art expositions occur across the world in major cities and regional areas alike. This session explores the centrality of the urban to biennials and their ‘festivalisation’ of art. We are interested in the relationship between the ‘heterotopia’ of such events and the city (concrete or imaginary) to which they are attached. These ‘mega events’ are endowed – financially and otherwise – with the potential to re-image and re-make the city, changing its identity. Such mega-exhibitions are of course bound up with a politics of place-branding for financial investment, real-estate speculation, regeneration and gentrification, as well as attracting local and global tourism. Dismissing such events as a cultural arm of neoliberalism, however, may discount the new identities and opportunities that they configure. This session aims to open the debate on ‘the city in the biennale’: the role of the city and the architectural spaces used and/or constructed in the organisation of such events, as well as the engagement with those spaces in the work of participating artists, curators and the public. To what extent have recent biennials followed on or departed from models like Venice or São Paulo? What facilities are used, adapted or newly built to accommodate displays and the circulation of visitors? What kind of architecture drives the spectacle? What dynamics of exclusivity or inclusivity are designed into the geography of such events? We welcome contributions from art historians, anthropologists, urbanists, curators and artists, and are particularly interested in case-studies from the emerging economies of Eastern Europe, Asia, Africa and Latin America. This looks to be an important publication. I flagged up about a year ago but haven’t provided full details. Tompkins, J. 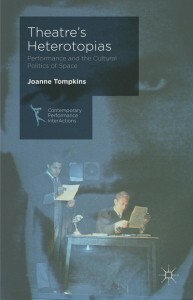 (2014) Theatre’s Heterotopias: Performance and the Cultural Politics of Space, Sydney: Palgrave Macmillan. “Theatre’s Heterotopias articulates a new methodology for interpreting a space (including architectural, narrative, imaginative, and imaginary) in theatre and performance. A heterotopia is an ‘alternative space’ that is distinguished from that actual world, but that resonates with it. The value in applying heterotopia to theatre is that in performance, we can actually witness how else space and place might be constituted: it is the point of comparison of what does occur against what else might transpire such that the ‘unreal’ spaces that comprise a theatrical experience have the capacity to elicit concrete effects beyond its walls. A heterotopia is a technique for exploring theatrical space that affords a better understanding of the theatrical experience, the context in which performance takes place, and the power and knowledge that shape its socio-political context. The book’s case studies include site-specificity, selected productions from the National Theatre of Scotland and Shakespeare’s Globe, and multimedia performance”. Bankovskaya, S (2014) A Conception of, and Experiments with Heterotopia’ as a Condition of Stable, Unpurposive, Everyday Movement. Higher School of Economics Research Paper No. WP BRP 70/HUM/2014. Gallan, B. (2015) ‘Night lives: Heterotopia, youth transitions and cultural infrastructure in the urban night’, Urban Studies 52 (3) 555-570. Laborde, S. (2015) ‘Environmental research from here and there: numerical modelling labs as heterotopias’, Environment and Panning D: Society and Space 33 (2) 265-280. Palladino, M and Miller, J. (eds.) (2015) The Globalization of Space. London: Pickering and Chatto. Witteborn, S. (2014) ‘Forced migrants, emotive practice and digital heterotopia’, Crossings: Journal of Migration and Culture 5 (1) 73-85.